« Indiepix Films @ TIFF! 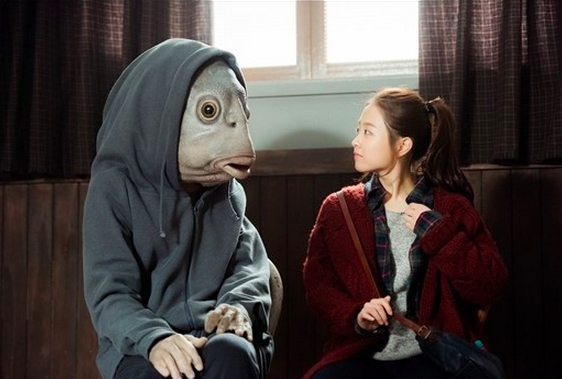 Yesterday we caught Oh-kwang Kwon’s COLLECTIVE INVENTION, a surreal new South Korean comedy about a young man who mutates partly into a fish. Walking around the city, Park Gu is taken in by local media and turns into an international celebrity. The film explores the selfishness of individual characters working in the media and pharma industries, hoisting the half-man half-fish up for abuse in Christlike style. Offbeat, quirky, and light-hearted, the film tries hard to get us to feel angry at greedy capitalists – not a tall order. The character design, inspired by a Magritte painting, is at times clunky but most of the time, it works. Last night’s premiere at the stadium-seating Scotiabank theater was packed – not an empty seat in sight – and drew lots of laughs from genre fans, so it’ll be interesting to see where this fish fantasy takes root abroad. This entry was posted on Tuesday, September 15th, 2015 at 4:22 pm	and is filed under Daily News, Events, Film Festivals, Home Featured One. You can follow any responses to this entry through the RSS 2.0 feed. Both comments and pings are currently closed.